Who, what, why: What does it mean to be de-arrested? 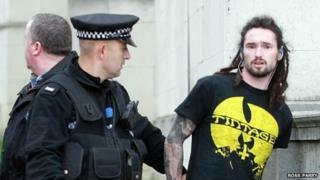 A jogger who bumped into David Cameron in Leeds was arrested and then de-arrested. But what does it mean to be "de-arrested", asks Tom Heyden. Dean Farley was running to the gym when he accidentally knocked into the PM. He was immediately seized by security staff and whisked away in a police van. He was arrested but after being questioned he was then "de-arrested". But although in literal terms he was released without charge, "de-arrested" is not technically the same as "released without charge". The key difference in terminology is whether the person is taken into custody and processed, says a spokesman for the Association of Chief Police Officers (Acpo). Normal procedure is that an arrested person is taken into the police station to a custody sergeant, to whom the arresting officer explains the case details, he says. If the arrest is valid then that person's belongings are taken and filed away. The person is put into a cell, interviewed and then potentially released within 24 hours (unless a 12-hour extension is sought), says the spokesman. But if at any point before that processing stage it becomes apparent there's no case to answer then it will be a "de-arrest" rather than a "release without charge", he says. If a case is dropped after the suspect is processed, the terminology would be "released without charge"
But that doesn't necessarily mean you can't be immediately re-arrested on different charges, as George Michael discovered in 2006. He'd been found slumped in his car and was arrested on suspicion of being unfit to drive. The singer was then de-arrested after a doctor's examination at a London police station - only to be arrested on charges of possessing Class C drugs. In Farley's case, the arresting officers were able to verify his story that he was on his way to meet his trainer at the gym. But in other cases it may be a case of mistaken identity, for instance. It may be that what is at one point a legitimate arrest is later nullified by evidence that comes to light soon afterwards - such as exonerating footage from CCTV - and the person will be "de-arrested", says Donoghue. Often during a bar brawl, he adds, police may grab as many people as they can before identifying the criminal culprits. But a de-arrest is not necessarily an admission of a mistake on behalf of the officer, says Acpo. And a de-arrest doesn't overturn the fact of the arrest, Donoghue says. "As a general rule of thumb, if somebody is nicked and within five seconds is let go on the scene, there's unlikely to be any formal record created." But if 10 minutes later the police catch the right person, the initial erroneous arrest may well be included in the police report, he says. Once it's in the system then it may come up in an enhanced DBS (formerly CRB) check, used to determine whether individuals should be barred from certain types of work, Donoghue explains.